As we enter into the season where our culture collectively reflects on all there is to be thankful for, my family has found new ways to be thankful in the last year and a half. If you had told me initially that I would eventually be thankful to have been diagnosed with diabetes I definitely would have given you a funny look. I do, however, believe the promise in Romans 8:28, which says, “All things work together for good for those who love God, who are called according to His purpose.” We don’t always get a glimpse into God’s greater plan, or see how He will work something out for good, but I have already experienced the beauty of having an illness that seemed so ugly at first. God used this situation to get me out of the destructive eating patterns and addictions I was stuck in, and He’s blessed my family with healthier patterns, as well. The kids and Jim love our new way of eating, and we are sick way less intensely and way less frequently than before. I also get to share my recipes and ideas with all of you, which is a blessing to me. I’ve seen how much power food had over me, and I’ve been set free from it. Food no longer determines my mood. I believe this is partly what the Bible is talking about when it refers to “freedom in Christ.” I am more able to live freely in the relationships God has placed in my life, including my relationship with Him. Living for the next food fix is way less freeing than living for my relationship with God and the people He’s given me. I pray that you can experience this freedom, too. How thankful I am for the way God has lead me and my family to a better place! The recipes I’ve been developing for the Fall, including this Paleo Pumpkin Alfredo have come out of this place of thankfulness and freedom God has put in my heart. It is so much fun to work with foods that bring life and health to me and my family, instead of sickness. This rich sauce/soup definitely inspires more gratitude for God’s rich blessings!!! May this recipe bless you as you connect with your loved ones during this cozy time of year! It may be a good addition to your Thanksgiving dinner as a soup course. Even though there are some coconut products in this Paleo Pumpkin Alfredo, mine did not turn out with a strong coconut flavor. I actually couldn’t taste the coconut at all, but it did add a little sweetness. If you are really against coconut you can use heavy cream, but it will not be as healthy. Your body burns the fat from coconut much more efficiently than milk fat. Before we get to the recipe for Paleo Pumpkin Alfredo, I want to invite you to join with others who are making healthy changes. I’d love to walk alongside you in your journey towards wholeness and health! Jesus said, “I have come that they may have life, and have it to the full!” Freedom from food addictions is part of having a truly full life. In a medium non-stick pot sauté the garlic in the coconut oil over medium heat, until it starts to turn brown. Add the pumpkin, coconut cream, 1 cup of chicken broth, nutmeg, salt, pepper, and sage and turn heat to low. Bring it to a simmer, stirring often, while you do the next step. Whisk together the eggs and the remaining cup of broth in a small bowl. Make sure the eggs are fully incorporated with the broth. When the pumpkin mixture is simmering, slowly pour it into the egg and broth mixture, whisking while you do so. Once you’ve added it, stir frequently and bring it back to a simmer or boil. I gradually turned the heat back up to medium. The sauce will thicken as the eggs cook. Remove from heat after it has thickened sufficiently. 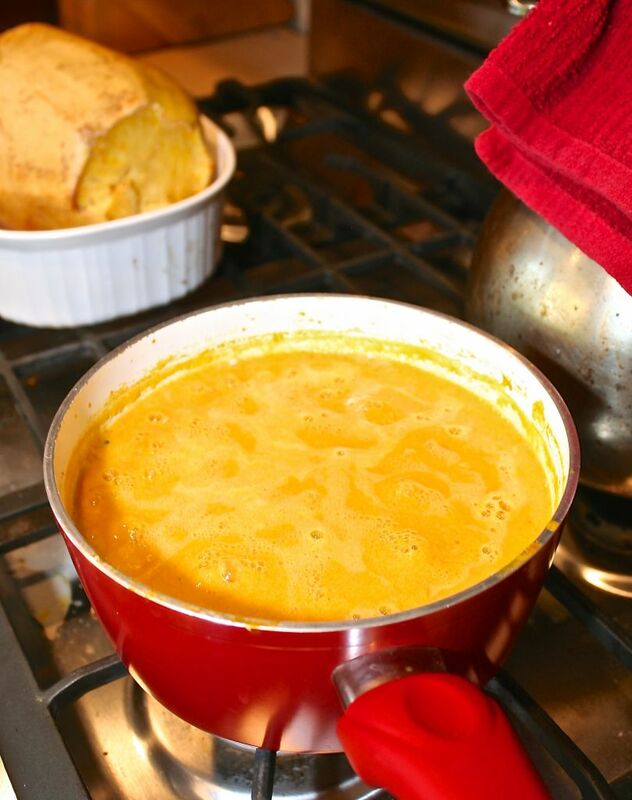 Serve the Paleo Pumpkin Alfredo Sauce on it’s own as a soup, or use it as a sauce for veggies. I served mine over spaghetti squash. Garnish with sage leaves. 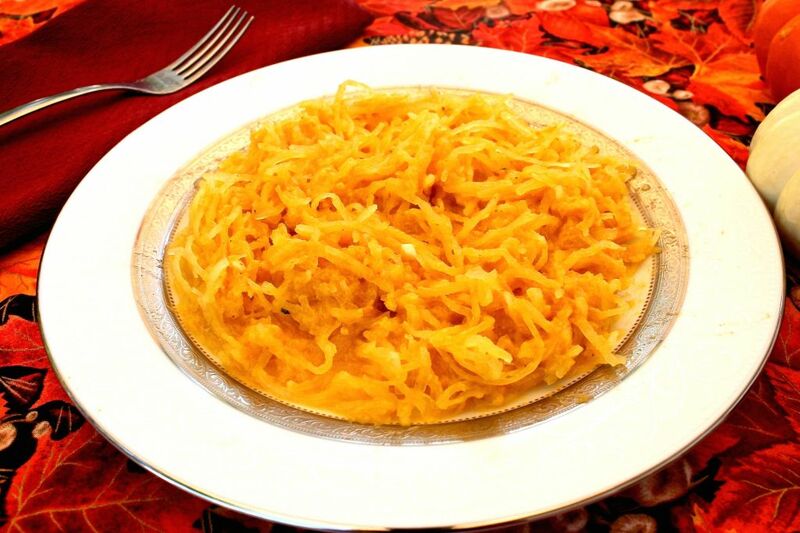 Here’s the Paleo Pumpkin Alfredo, all mixed into the spaghetti squash noodle. It looks a little like mac n cheese! Note: to roast the spaghetti squash I just slit some holes in the skin and put it in the oven on a cookie sheet for about an hour to an hour and a half, turning it over part way through. It should be a little brown on the outside and feel fairly soft when you cut into it. If it feels too hard when you cut into it, just put it back in. When it’s finished use a fork to gently scrape out the “noodles.” Enjoy! 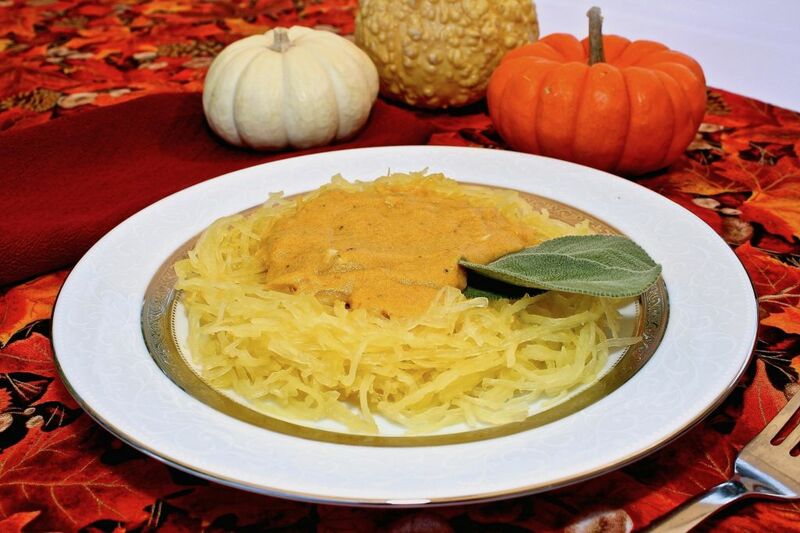 6 Responses to "Paleo Pumpkin Alfredo Sauce"
Awe, thanks, Tia and Tio! Much love to you both!